There’s still time to get this week’s Deal of The Week at The Perfume Shop. 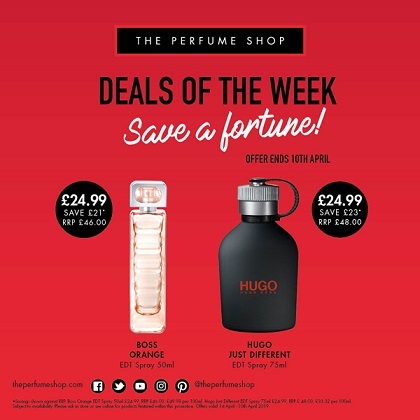 Until 10 April you can splurge on Boss Orange EDT Spray 50ml at £24.99 down from £46.00 saving you £21.00 and Hugo Just Different EDT Spray 75ml at £24.99 down from £48.00 saving you £23.00. Hurry while stocks last.